For you ever evolving souls who want that juicy clarity and confidence in work, life & love. Get Your Free Training + Meditation. A transformational coach, creative-type, changemaker, and modern mystic committed to helping you get clear on your truth and trust yourself enough to live it. Unapologetically. My work is devoted to helping you remember who you really are. Not just who you were taught to be. This is your mf birthright. And it’s the most revealing and sweetest journey of your life. The sweet journey within requires you to slow down. 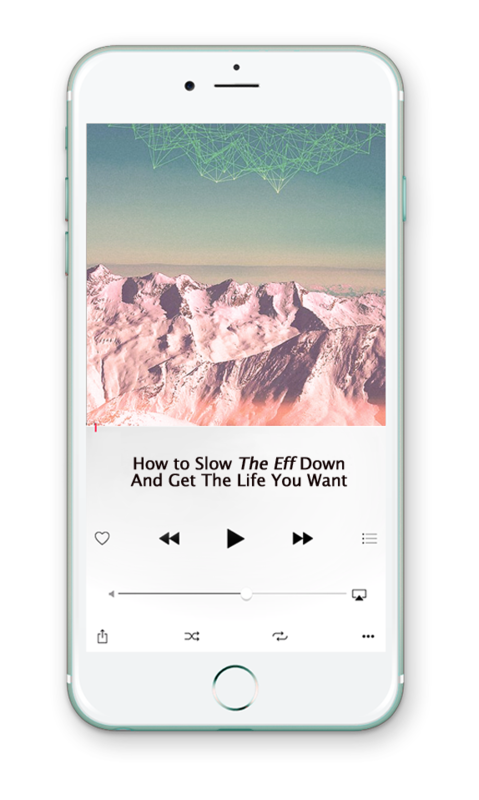 With this free audio training, guided meditation/visualization & downloadable guide you’ll receive insights into true the cost of hustling through your life + strategies to spark your deepest CLARITY. You’ll also get a delicious grounding meditation designed to supporting you in slowing (the eff) down and getting in deep alignment with what’s most important to you. When I started working with Dana I was feeling disconnected from myself, longing for a way to dig deeper, clear out the negativity, anxiety, and fear that had felt more present in my life than ever before. Dana provided a safe and encouraging space to clear out old ways of thinking/being and opened the door to see the abundance around me and the power I have to create a life in my own vision...I came away feeling empowered to just be me in a way I've never felt! I've felt a shift in the pride I take in my work and my drive to see that work succeed. In our work, I set a "deep" dream number for my business. I'd never made that much before. And I hit it!!!! I can't believe it. I have my new number for 2018, I'm feeling the major momentum! I never believed in coaching until I met Dana. She was the person I could hear, and through this gift, was able to hear myself – my fears, hopes, desires, and dreams. At a time when I was making weighty decisions in my personal and professional life, Dana’s guidance enabled me to tap into the deep beliefs hidden beneath the surface of my everyday life and find clarity and vision for my future. Dana is a truly special coach that helped me create energy in areas of my life that felt stagnant. She taught me the power of intention and guided me towards a true understanding of empowerment. Her guidance, encouragement and thoughtfulness helped me see things in ways I hadn't previously. Her work is remarkable. Just like her. Dana helped me re-discover my light and with her I went on a radial journey of learning to love myself once again. Dana lovingly helped me re-write my story of who I am. She helped me see the stories that had unconsciously been running the show of my life for 20 years. I can now say that I deeply believe in my own worth, my power, and my capacity to create change, both for myself and for the world. Dana led me to the most beautiful discovery I could have ever hoped for: self love. Working with Dana has brought me the liberation I'd sought for so long, but didn't know how to access. She is a miracle worker. Dana is the real deal, doing transformative healing work that our world needs. If you aren’t sure what you want and/or you don’t know how to get there, then we should definitely talk. Book your free 30 minute discovery session!